Here’s a picture of my USMC Forward Air Observer team. Below the picture you will find some tactics but also some historic information about the FAO as deployed in the pacific theatre. The American Army special rules allow you to perform two airstrikes per FAO to emphasize the role of American air superiority in WW2. Therefor taking a FAO in an American army is a good tactic but also a big risk because instead of the risk of rolling a 1 is now doubled per game… The chances of friendly fire casualties are a risk I’m willing to take. First of all the Bolt Action name FAO (Forward Air Observer) is not correct for the Pacific theatre. The correct name should be FAC (Forward Air Controller) or ALO (Air Liaison Officers). With that out of the way let’s have a look at their role and how they performed. At the beginning of the pacific conflict the FAC’s would not direct airstrikes to their targets from the ground but from a training twoseater plane that was followed by the CAS (close Air Support) Pilots. The FAC would locate enemy positions and relay them to the CAS pilots. At the battle of Guadalcanal the pilots were given destination targets before take-off and troops on the ground were unable to redirect the planes once they were in the air. For the battle for Henderson airfield this wasn’t much of a problem because the planes took of from Henderson airfield and reached their destination within seconds from take-off. But at the battle for Tarawa the pilots had been in the air for some time unaware of changes in the battles on the ground. Also the airplanes that were available were fitted for air to air combat instead of Close air support and the pilots were not trained for this role. Their planes could not carry bombs or rockets but had machine guns instead so they could only strafe the enemy positions. However they were very successful in strafing the Japanese on Guadalcanal when they tried to outflank the Marines from the sea. The pilots strafed the landing crafts and killed dozens of Japanese troops and the Marines defending the airfield could finish off the survivors. 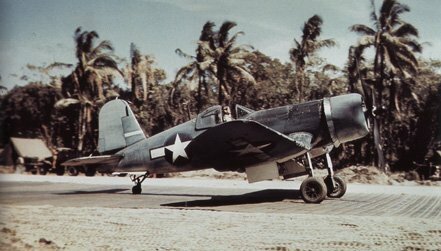 The fighting on Guadalcanal saw the use of the P-400, F4F, and SBD. Although pressed into service at a critical stage in the war and forced into a mission for which they were not well suited, these aircraft performed admirably and had limited success. Close air support on Tarawa was provided by F6F Hellcats and TBF Avengers. These aircraft were limited in their CAS capability and were still not able to directly impact the battle below as desired by the ground commanders. 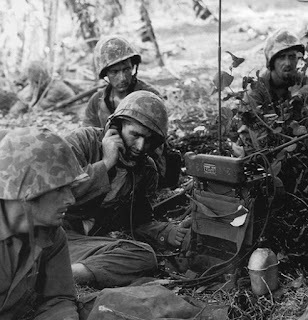 In later missions of the island hopping campaigns ALO’s (Air Liaison Officers) were attached to battalions or regiments once the marines had established a safe beachhead. The ALOs were naval pilots who, although well versed in naval air superiority doctrine, were not thoroughly trained in coordinating CAS for an assaulting infantry force. The ALOs would pass requests by radio to the Air Support Command Unit (ASCU) aboard the attack force flagship. The ASCU would then pass the CAS request to the aircraft in the air or to the aircraft carrier. The CAS pilots would be directed to a spot on the ground as referenced by a grid system that subdivided the island into number and letter coded boxes. 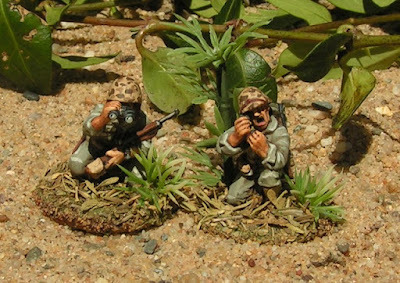 The ground forces were issued brightly colored panel markers to identify friendly troop locations in an attempt to avoid fratricide by the CAS aircraft. The ALOs with the ground units would communicate with the ASCU aboard the flagship using the Navy's portable TBY radios as they moved ashore. These radios were complex to operate and not waterproofed. This vulnerability would be crucial to the ALO's ability to call for CAS and fire support. However, the fragile TBY radios used by the ALOs had gotten wet during the assault and had to be disassembled and left to dry in the hot sun. There would be no calls for fire until they could be dried and reassembled. The introduction of the F4U Corsair (particularly the F4U-4 version in early 1945) by the Marines was a large step in the right direction because of its ability to carry a larger payload over a longer distance at much higher airspeeds. 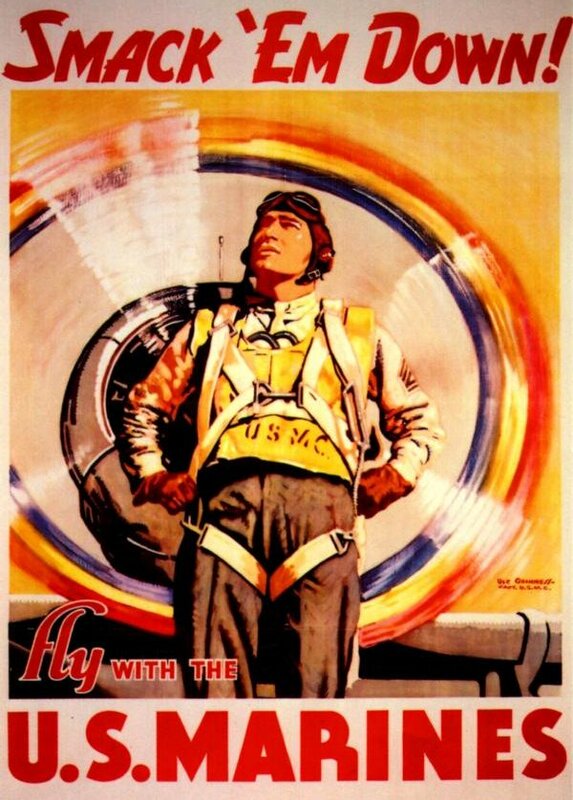 With the F4U-4, the first 20-millimeter (mm) cannons were installed on a Marine fighter aircraft. The most conclusive developments at the end of the war in the Pacific, however, were the Air Liaison Party (ALP) and the Landing Force Air Support Control Unit (LAFASCU). These air-ground liaison organizations gave the infantry commanders the direct link they needed to integrate air support with their tactical plan. Their ability to call in airstrikes from the ground at the right time at the right place played a pivotal role in combat granting the troops on the ground vital air support.